We manufacturer, exporter and supplier of a Nylon Fittings and Rubber Logos to meet great demand in the national as well as international market as these are neatly designed, better grip, excellent finish and easy to install. These nylon fittings and rubber logos are available in different design, shapes and sizes can be custom built as per the need of the customer. We fabricate these nylon fittings and rubber logos using supreme quality raw material based on latest technology, which meets the international quality standards. We have on offer optimum quality Nylon Fittings that are designed and developed using advanced technology and quality raw material. These fittings are manufactured and made available in various shapes and sizes, as per the specifications of clients. Before dispatching these fittings to the market, we conduct stringent quality checks on them. 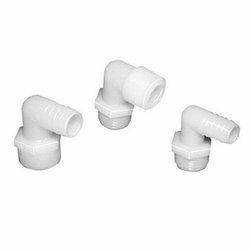 Precision engineered and durable, these nylon fittings find huge demand in the market. Wide range of catalogue is available with us to choose from. Can be shared with customers with guarantee of taking mass production. Looking for Nylon Fittings and Rubber Logos ?